After our tourists arrive at Katmandu, they will be assisted by our "ITS" representatives. After reaching at the hotel, our tour manager will tell in the precise manner about the tour schedule to all our tourists. For rest of the day, tourists are free to relax or carry on their individual activities. In the morning, we will pay a holy visit to one of the most sacred temples-Pashupatinath temple. The temple is dedicated to Lord Shiva and was built in 1696. We continue with our sightseeing tour by visiting Patan city. After that, we will also visit famous Tibetan Handicraft center to have a look on the beautiful carpet weaving work. In the early evening, we will move towards the Swayambhunath complex which comprises of variety of shrines, temples and stupas, including a library and museum. After travelling for a few minutes, we will reach Boudhnath-world's largest Stupa and then we will go to Durbar Square. Before leaving for the hotel, we will visit famous Kathmandu temple. 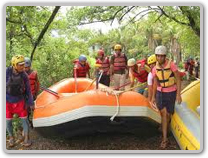 In the early morning after taking our breakfast, we will proceed for 2 hours drive to enjoy river rafting. 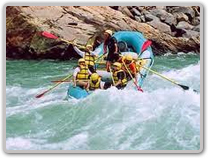 Tourists will surely going to have a whale of time while enjoying rafting at Trishuli River. After having our lunch, we will proceed for Gorkha- one out of seventy five districts of Nepal. Gorkha's palaces and markets is "most-visited destination" of the district. Next day after visiting Gorkha, we will take a 3 hours drive to one of the most beautiful valleys of Nepal- Pokhara. One can experience the eternal beauty of nature and go gaga over its snow-covered mountains, narrow streams, pristine lakes, etc. We will check-in the hotel during night only. in Pokhara. Entire day is devoted for watching some of the famous tourists' destinations like Phewa Lake, a shrine of Barahi Goddess, Seti River, Patala Chhango and Mahendra cave. In the night, we will drive back to hotel for an overnight stay. In the early morning, we will board a flight for Katmandu. After reaching Kathmandu, tourists are fee to spend leisure time either by going for shopping or by relaxing at the hotel room. During night time, dinner will be followed by famous Nepali cultural program. After breakfast, tourists are allowed to leave for their final destination i.e. their homeland.